Performed deep into the night, raga Darbari is characterized by solemnity as well as a deep sense of longing and devotion. The gravitas of this raga tests the very limits of any master vocalist. Darbari stands at the very pinnacle of the repertoire. It is derived from the ancient South Indian raga Kanada, which uses the same notes as the natural minor scale, and is therefore often referred to as Darbari Kanada. It creates a sense of spiritual awakening that arises from the unique collection of melodic contours and ornaments that blossom in performance. 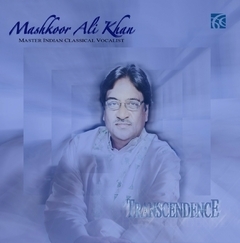 The profound emotions of Darbari are flawlessly evoked in this recording by Mashkoor Ali Khan, or Khan Sahib as we respectfully call him. The raga is not necessarily somber, however, and can be joyful as portrayed in the drut bandish (fast composition starting at 47:12) which deals with anticipation and reunion. Khan Sahib and the great vocalists of his lineage, the Kirana gharana, shine in their rendi­tions of deep and emotional ragas which unfold over a slow tempo and are well suited to an extended barhat (development of the raga). This provides a vehicle for them to display their mastery of the raga, meticulously delineating each note in a myriad of ways, and working around the musical polarities of the vadi and samvadi (the principal and main supporting notes). For these reasons Darbari remains one of the much-favored ragas within the Kirana gharana.